Assassinated only sixty-two days apart in 1968, King and Kennedy changed the United States forever, and their deaths profoundly altered the country's trajectory. 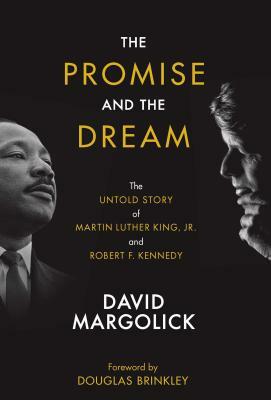 In The Promise and the Dream, Margolick examines their unique bond and the complicated mix of mutual assistance, impatience, wariness, awkwardness, antagonism, and admiration that existed between the two, documented with original interviews, oral histories, FBI files, and previously untapped contemporaneous accounts. At a turning point in social history, MLK and RFK embarked on distinct but converging paths toward lasting change. Even when they weren't interacting directly, they monitored and learned from, one another. Their joint story, a story each man took some pains to hide and which began to come into focus only with their murders, is not just gripping history but a window into contemporary America and the challenges we continue to face. Complemented by award-winning historian Douglas Brinkley's foreword and more than eighty revealing photos by the foremost photojournalists of the period, The Promise and the Dream offers a compelling look at one of the most consequential but misunderstood relationships in our nation's history. David Margolick is a long-time contributing editor at Vanity Fair. Prior to that, for fifteen years he was a legal affairs reporter at the New York Times, where he covered the trials of O.J. Simpson and Lorena Bobbitt, among others, and wrote the weekly "At the Bar" column. His work there was nominated four times for the Pulitzer Prize. He has been a frequent contributor to the New York Times Book Review, and the Wall Street Journal's weekly Review section. He is the author of many books, including Dreadful: The Short Life and Gay Times of John Horne Burns; Elizabeth and Hazel: Two Women of Little Rock; Beyond Glory: Joe Louis vs. Max Schmeling, and a World on the Brink; and Strange Fruit: The Biography of a Song. He lives in New York City.